We left Simpson Bay, St. Maarten at 5 AM as planned. We had good downwind sailing again, so we immediately put up the spinnaker and used it the whole way. Fishing was poor on this passage, but the weather was nice. When we were about halfway, a US Coast Guard helicopter flew over us and hailed us on the VHF. They asked some basic questions about us, and Frank answered as a courtesy. Not being in US waters, we weren't required to answer questions unless there was an emergency. When we were about 12 miles off Virgin Gorda, Karen and the girls heard some strange "squealing" noises down inside the boat. Frank at the same time noticed something weird off the side of the boat. Sure enough, we had what we initially thought were dolphins. Then we realized they were much bigger. It turns out they were False Killer Whales. 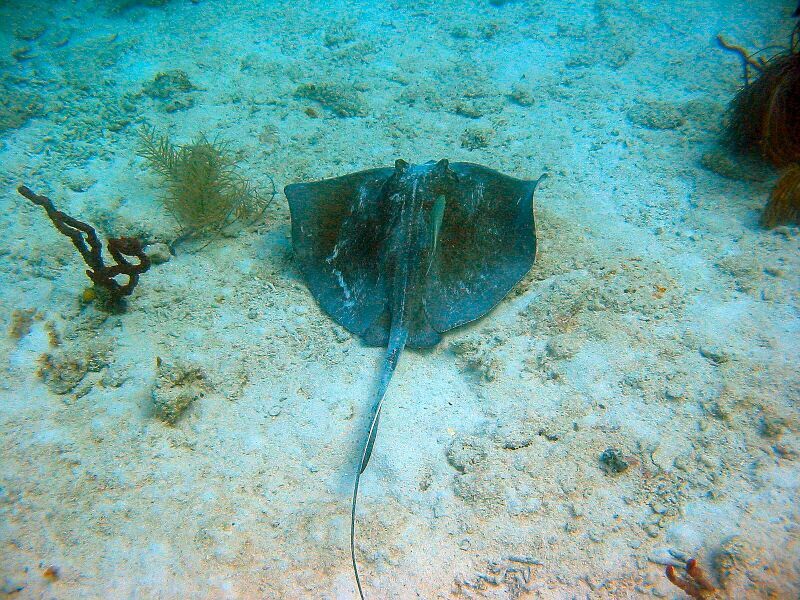 These wonderful animals are much rarer than the other visitors we have had. They are just as playful as most dolphins, but grow to 20 feet in length and are about twice the size of most dolphins we saw. Since they are of the whale family, it explains the "squealing" noise we heard. They have flat heads instead of the "beak" or "bottle nose" you see on the more common dolphins. We were too enthralled to take pictures - besides, they only rarely put their noses above the water and the light was wrong for good pictures. They did swim a good while mostly in our wake. Actually, it was because they were doing this that we noticed we had about a 15 foot peice of net caught on one of our props. Maybe they swam there just so we would notice? Here's a link to a web site about False Killer Whales. 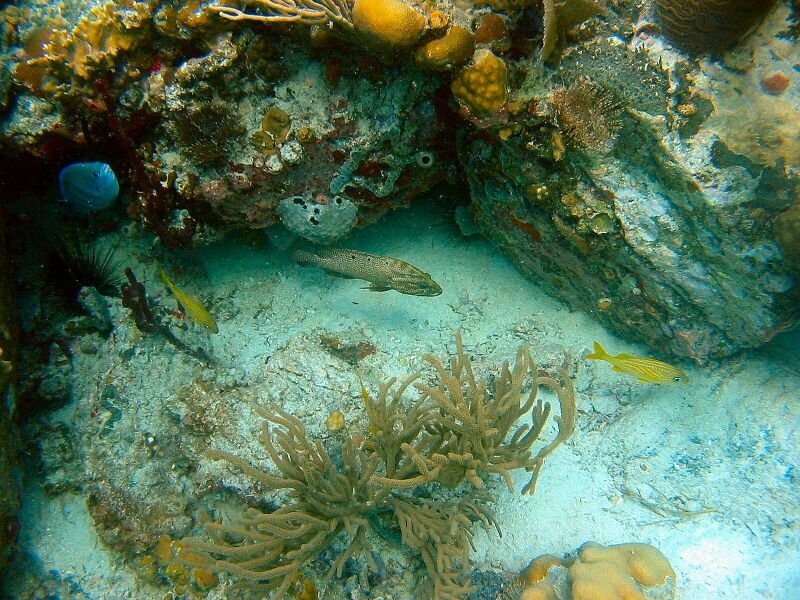 We did catch a Barracuda when we got to shallower waters off Peter Island. The winds died off on us a bit later and we carefully dropped sail and started only the starboard engine (since the other prop still had that peice of net on it). We motored into the lee of the island and then Frank jumped over and got the net off. 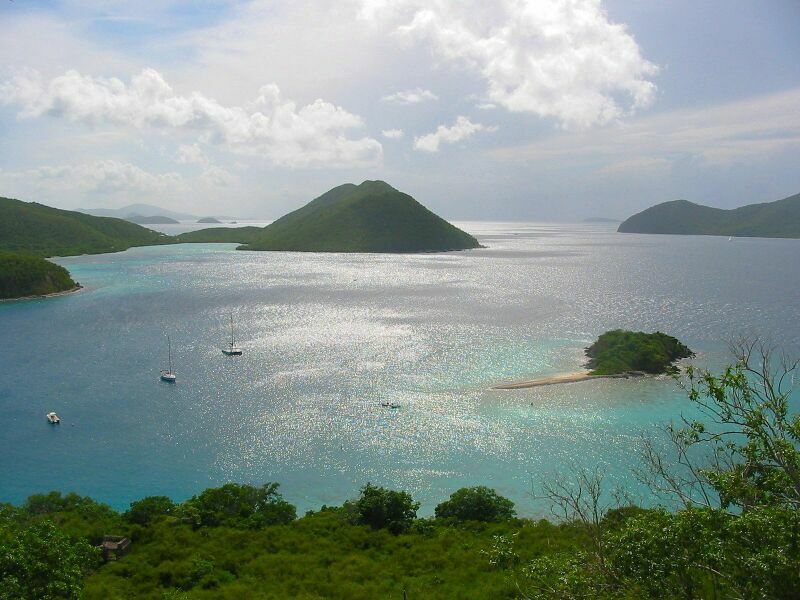 Once we were out of the lee, we were able to raise the spinnaker again and sail the rest of the way to St. John. We pulled up a mooring in Leinster Bay well before sunset. Actually, we suddenly realized the sun was setting at a later hour. The 200 or so miles further west was already making a difference. 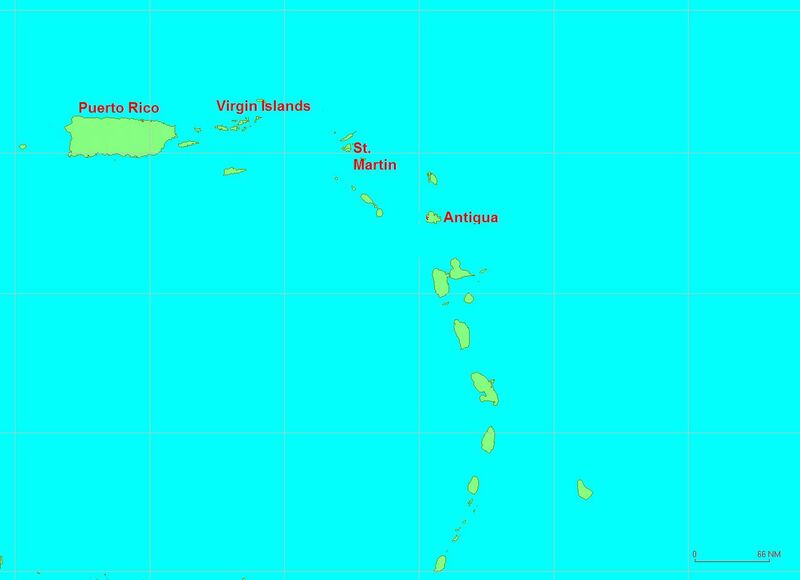 We were nearly a 100 miles further west from St. Martin after just 13 hours of sailing on this day. The next morning we did some home schooling. 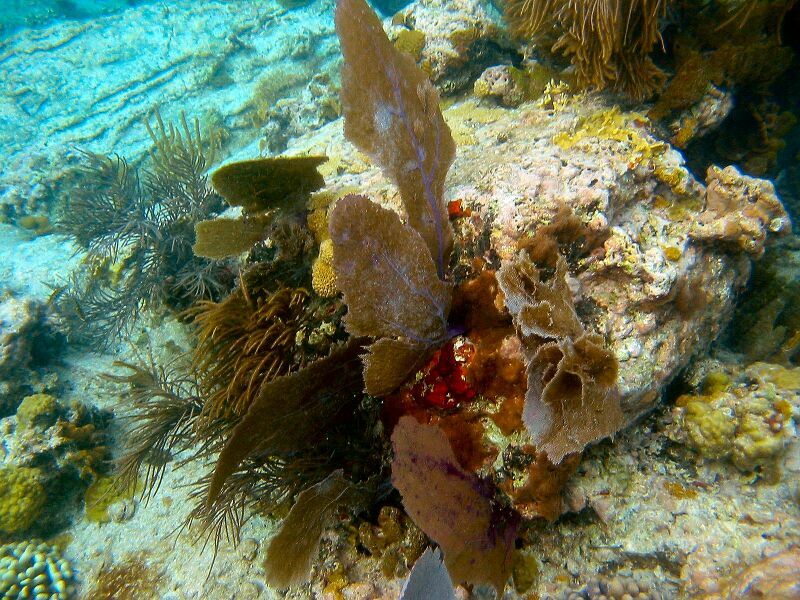 Frank did some snorkeling for a while and he hiked some trails and took some pictures of the area. 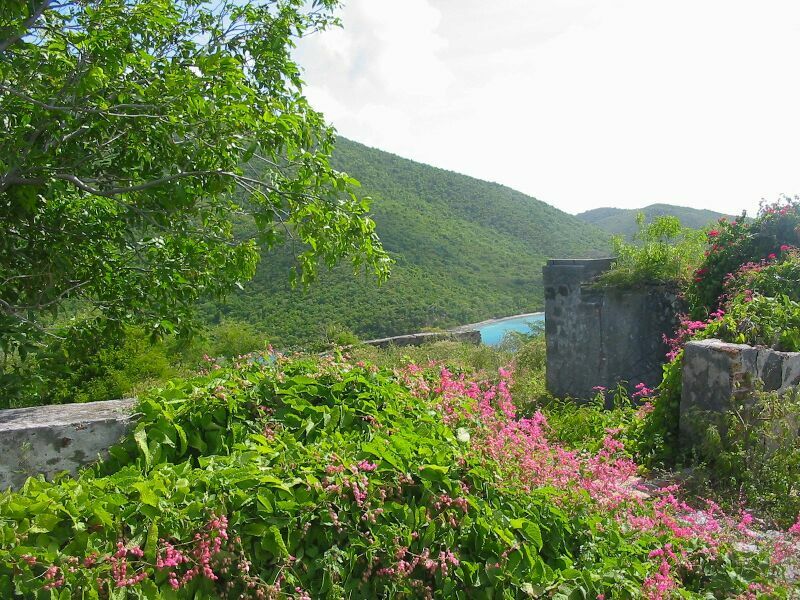 Here's a picture of some flowers in the ruins, and a nice view of Leinster Bay, St. John (notice PatiCat is down there - the little island is Water Lemmon Cay, and is where the snorkeling was done). Later in the morning we tried looking for our friends on Genesis with Voyage Charters. Apparently they were on a charter for the week, so we were not going to be able to see them this time. We took PatiCat over to the other side of St. John so we could clear into customs at Cruz Bay. Frank had to take the family in to clear in this time as they wanted faces with the passports. A weird formality as no other country we visited required this of a cruising yacht. Anyway, we then took the boat over to St. Thomas. The first thing we did was to go to the Cold Stone Ice Creamery. Yum! We then went over to the little book store that caters to cruisers there in Red Hook. Again, the woman who runs the place had a bunch of kittens she was caring for for the SPCA. The girls loved playing with the kittens while we bought some books. The next day we took a taxi into the area mall and did some shopping. Then after one more trip to Cold Stone and the bookstore, we got some fuel for PatiCat and then went back over to St. John. The next day Karen and Frank did some laundry in St. John in the morning, then we moved the boat back to Leinster Bay. We had a nice sail upwind this time, and even tacked our way through a place called The Narrows. A very narrow area between some islands which took us about 6 or 7 tacks in 30 minutes. It was fun, and showed how our sailing skills have improved in our year+ with the boat. That afternoon, Frank went snorkeling one last time in the VIs and took some more pictures. On Sunday we rendezvoused with Hotel California for one last visit before we left to head home. They were going to stay a few more days in the VIs before heading to the east side of Puerto Rico where the wife and kids were going to fly home. Wilson was planning to take on a crew and sail HC straight back to Florida. 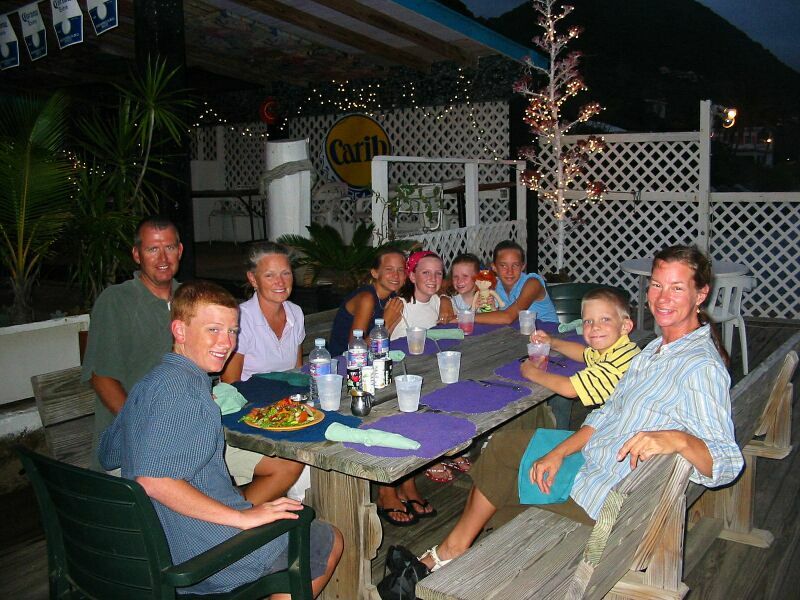 We had dinner with HC that night and a good time was had by all. The next morning, we said our Au revoirs to them and we knew we were really going to miss having our two boats together. But, we're sure we will see each other again someday. 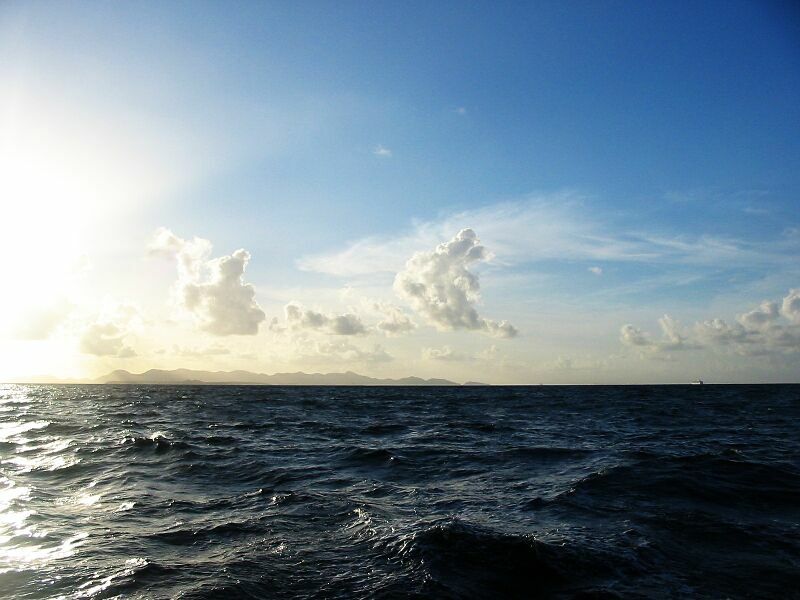 We left around 11 AM to sail to Culebrita which is in the Spanish Virgin Islands and is part of Puerto Rico.